Is the D90 kit lens, the Nikkor 18-105mm f/3.5-5.6 VR not enough for your needs? Then it’s replacement the AF-S NIKKOR 24-120mm f/4G ED VR may just fit the bill. The NIKKOR 24-120mm will work with both camera’s cropped sensors like the D1000, D5000 and D90 and full frame models like the D300s and D3. Nikon UK is pleased to announce the release of the AF-S Nikkor 24-120mm f/4G ED VR, a brand new 5x zoom lens for FX format D-SLR photographers. The 24-120mm focal length continues to be a unique proposition in the Nikkor lens range and the new version features a fixed f/4 aperture throughout the zoom range. It incorporates Nano Crystal coat and Nikon’s second generation VRII system. 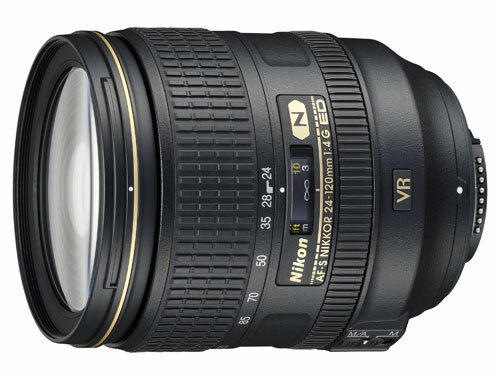 The AF-S Nikkor 24-120mm f/4G ED VR is equipped with Nikon’s second generation Vibration Reduction system (VR II) which offers compensation for camera movement the equivalent to a shutter speed of approximately four stops faster, and couples well with the f/4 fixed aperture under low light conditions. The system incorporates two modes: Normal for general handheld shooting and Active to compensate for the mechanical vibration frequencies caused by planes and moving vehicles. The lens is supplied with a dedicated hood HB-53 and a soft pouch.